While in Havana, Cuba I wore the least amount of clothes legally allowed. It was sweltering and what I wore reflected that. Now that I’m back in the states I had a great excuse to throw on a suit and tie. Suitsupply Tampa invited me to their Toast to the Summer event. So, let’s step through the suit that I wore. The Toast to the Summer VIP event was held at Suitsupply Tampa over in Hyde Park which is an area of Tampa I had not had the chance to experience prior to that day. Overall, it was a very nice area with places to shop and eat. There was a Bartaco right down the street from Suitsupply. Bartaco, if you haven’t had a chance to experience this restaurant, is basically an opportunity to pig out on delicious tacos and craft beers. It was the perfect meal stop after the event. Speaking of the event, Suitsupply Tampa put together this pretty posh gathering with drinks, music from a live DJ and personalized shopping experiences. Before I go on, let me take a moment to paint the picture of this glorious and unique summer cocktail that they had on tap. Aside from the usual domestic and import beers, they had this green cocktail that had crushed ice, and a slice of cucumber as a garnish. It caught my eye, and I ran over for a glass. Chatted up the bartender and she told me that this cocktail consisted of the following ingredients: Gin, Cucumber Soda, and fresh cut Jalapeno. I took a sip and was legitimately knocked back off my feet. This bizarre blend created an experience that was both refreshingly sweet and searingly spicy. It was perfect for summer and is something I’ve got to recreate at the house. Right, I was supposed to be talking to you about this outfit. My apologies for getting a bit distracted. So, I wore Suitsupply’s half-lined Washington cut. This is an extra-slim fit suit, featuring a strong, structured shoulder. Adorning the front of this suit jacket are peaked lapels, two buttons, and large patch pockets. There are side vents on the jacket and I opted for no cuffs on the trousers. The Washington half-lined is one of my favorites and it is a perfect suit for my frame due to its peaked lapels and slim fit. Now this suit served as a strong foundation for some of my go-to details. The Trashness Extreme Cutaway Shirt is my favorite when wearing ties. It really brings the tie and the knot to the forefront and is uniquely elegant. I am notorious for wearing boldly colored pocket squares, but something about this classic white silk pocket square just felt so right with this suit. The Daniel Wellington watch with the dark brown leather band, coupled with the adjoining brown quail-print tie, and brown leather tasseled Allen Edmonds loafers formed a perfect trifecta of steez. Subtle details are always my favorite as it is sort of a secret, nonverbal language spoken only by those fluent in menswear. As the DJ spun the tunes, I had the wonderful opportunity to go through a suit shopping experience that was tailored to my specifications and current style trends. 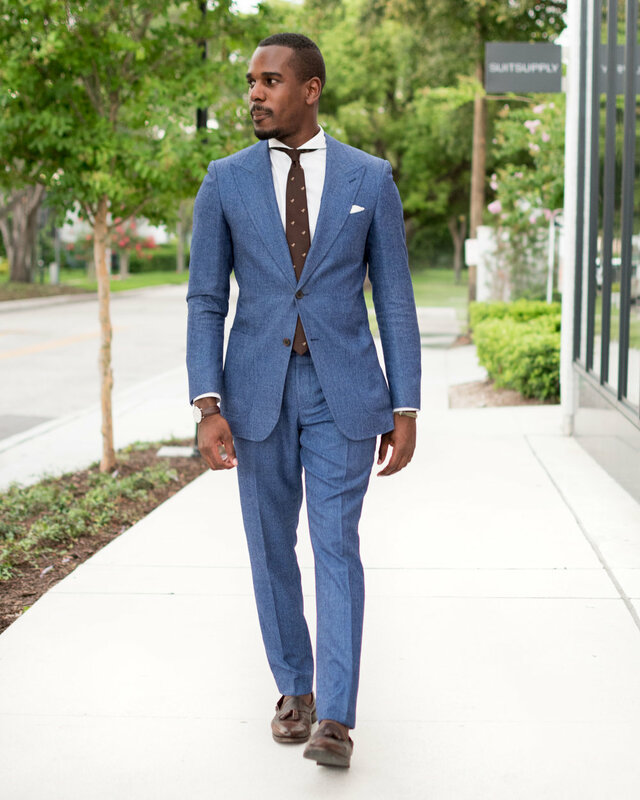 Chayanne Muñoz, a qualified Suitsupply stylist and good friend, walked me through identifying the appropriate fit, perfect suit, and shirt and tie to compliment it all. Be sure to check that out by clicking the link below. Its summer, so you know what that means; impromptu trips, gratuitous excess, and an opportunity to try some new summer style. This recent weekend trip to New Orleans was one of those last-minute opportunities that comes up where the stars aligned. I seized that chance and figured once I got there I’d hit the streets to see what the city has to offer. Seldom do two things come together more perfectly. The blazer with jeans look is one that is ideal for those transition seasons like Spring and Fall. Read more for the simple tips to perfecting this style. A denim jacket is an essential piece in every gent’s closet. It is a very versatile jacket that can really up the stylishness of an otherwise casual outfit. But wearing it in a more professional dapper steez can be a bit challenging. Let’s see how we easily incorporate the denim jacket into your workwear. “The Dapper Hour was a night of satisfaction. Satisfaction not only for your palette but for your inner steez and yearning for mutual fellowship.” Well, we know how my palette and yearning for mutual fellowship was satisfied, so let’s take a deep dive into how my steez was satisfied the night of The Dapper Hour.